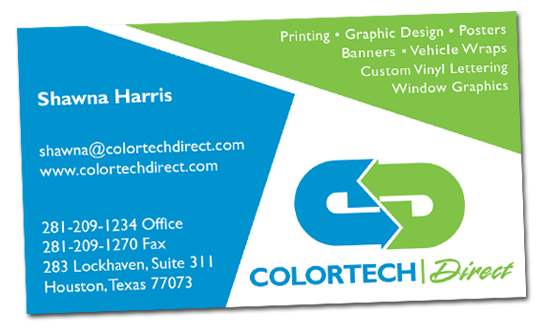 Colortech Direct does AWESOME Business Cards! Professional business cards are a must when it comes to reinforcing a strong first impression. A professional business card is not only an essential tool in your executive toolbox, but will positively influence how clients perceive you. Don't underestimate the power of a great looking business card! The Business Card pricing below is for standard turnaround and UV coating finish. Many other options are available. These prices do not include graphic design or layout. Once your business card design is on file here, we will be able to make quick edits and updates as needed.